In the early 1930s, Yugoslavia had two cavalry divisions. Each cavalry division consisted of two to three cavalry brigades with two regiments, one artillery squadron, a cycling battalion and other supporting units. It was planned to attach a motorized regiment to each division. However, it was necessary to obtain some light tanks or tankettes for these new cavalry units. The primary problem was sourcing the new equipment. France was unwilling to sell its latest tanks but wanted to dispose of the older surplus models. Through the French, Yugoslavia had at its disposal around 56 older Renault-Kegresse M-28 and FT tanks, some having been bought and some received as military aid in the 1920-30s. In mid-1935, Yugoslavia bought 54 relatively modern R35 light tanks from France. The Yugoslav Army had contemplated acquiring some new Soviet tanks (T-26 or BT series); however, this was not possible due to political reasons. During 1933/34, several Czech and Polish tankette models were tested. The Polish TK3 tankette was the first tested in February 1933. The results of these tests are not known, but the Yugoslav Army did not order them. Czech tankettes were next to be tested. The first was the vz.33 in July and then the Škoda MU-4 in October. Both vehicles performed poorly, mostly due to frequent problems with their engines. After the unsuccessful trials, the MU-4 was returned for refurbishment, and the vz.33 was outright rejected by the Yugoslav Army. The MU-4 was rebuilt with a new, more powerful, 40 hp engine and also received a series of minor modifications. This model was again sent to Yugoslavia between the 20th and 31st of October 1934 for evaluation. Although many mechanical problems were solved, the Yugoslav military leadership still rejected this modified vehicle. After these failures, Škoda began development of a new tankette, better armored and armed with a 37mm cannon. The prototype was completed in mid-1935 under the designation Š-I-d. 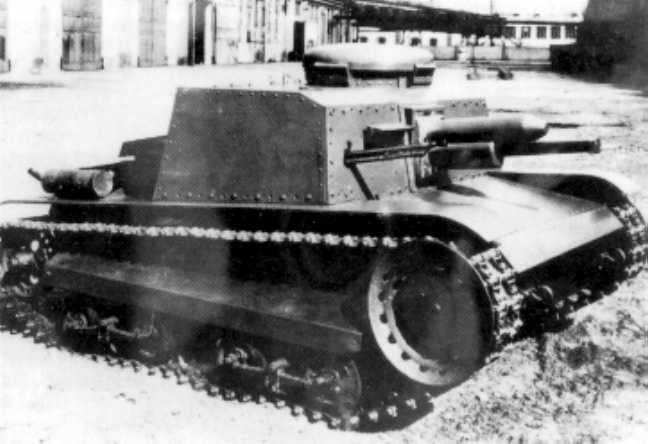 In 1936, this new tankette was presented to the Yugoslav delegation, which had a series of concerns. One of the main concerns was the thickness of the front armor. Yugoslav delegation insisted that the armor should be 30mm and not 20mm as it was on Š-I-d prototype. Although the later production model Š-I-D would have a thicker armor (22mm), it was still not thick enough. But as this model went into production, it seems that there was a kind of compromise between the two sides on that matter. Once these concerns were addressed, the Ministry of the Army and Navy of the Kingdom of Yugoslavia and Škoda finally signed a contract on the 30th of June 1936, for eight improved Š-I-D tankettes. After some delays, they were delivered in August 1937. The Yugoslav Army had plans for a larger number of field tests in 1938, and if they were successful, they would buy a large number of this tankette. The Supreme Command of the Yugoslav Army decided to acquire them from Škoda, for two simple reasons. Firstly, both countries were members of the so-called “Little Entente/Мала Атанта” ( the alliance formed in 1920-21 by Yugoslavia, Romania, and Czechoslovakia). And secondly, the Yugoslav government signed a 3 billion Dinar loan with Škoda. The Š-I-d prototype was based on the unsuccessful MU-4 tankette since the Yugoslav Army demanded certain changes (one of the main requirements was a need for stronger armor), serial production did not follow. The fate of the Š-I-d prototype is not known. The Š-I-d designation is an abbreviation, with “Š” stands for the manufacturer, Škoda, “I” (Roman number for 1) represents the vehicle category (category I for tankettes, category II for tanks and the category III for “heavy” tanks) and “d” – “dělový” for a gun version designation. The Š-I-d consisted of an armored box casemate with a command cupola. Front armor plates were 20mm thick, the sides 15mm and the rear was 10 mm thick. The armor was riveted. The crew could observe the surroundings through two observation hatches in front. The vehicle was 3.1 m long, 1.9 m wide and 1.6 m high. It had four running wheels mounted on two bogeys and three support rollers on each side. The armament consisted of one Škoda 37mm A3 cannon and one machine gun (around 1000 rounds). The gun elevation was -10°/+25° and traverse -15°/+15°. The vehicle had a crew of two and a 55 hp petrol engine. The improved Š-I-D (note the capitalized ‘D’) was accepted into service under the designation of “Брза борна кола T-32” (Fast fighting car/vehicle). Among the soldiers, they were known as “Škoda ŠID (Шид)” because of the name Š-I-D. They were incorporated into the Armored Vehicles Squadron of the Cavalry School based in Zemun (Земун). The first commander of this squadron was Second Class Captain Dušan Radović. Unlike the prototype vehicle, the production version was approximately half a meter longer (3.58m), with roughly the same width (1.95m) and slightly taller (1.76m). It had one more running wheel and one more supporting roller. Like the prototype, it had a simple box-shaped superstructure with a command cupola on top (similar to other Škoda models). The front armor plates were 22mm thick (not 30mm as the Yugoslav army demanded), sides 15mm and the rear was 10mm thick. It also kept the two observation hatches from the prototype version. The engine was also more powerful petrol engine, providing 60 hp, compared to the 55 hp of the prototype. The main armament was the improved Škoda A3J 37.2 mm gun (42 rounds). The secondary weapon was the ZB vz.30 J machine gun (1000 rounds). The gun could elevate -10°/+25° and traverse -15°/+15°. It was a modern gun at that time, with an effective firing range of 1,000 m, and its penetration power at 500m (at 30°) was 30-32 mm. At that time, German tanks, depending on the model, had armor of approximately 14.5 mm or more. As such, this gun had the ability to destroy most contemporary German tanks at a reasonable range. Two crew members were needed to operate this vehicle, a driver who also used the machine gun, and the commander, who was at the same time gunner and loader of the main gun. This was far from ideal, but for tankette standards of the era, was completely normal. To gain access to their battle positions the commander and the driver used two hatch doors on the roof. The commander entered through the command cupola and the driver through the hatch next to it. Compared with the tankettes from other countries, on paper T-32 was a major step forward. This tankette had a low silhouette, was fast, well armed and armored. However, the T-32 suffered from problems with its suspension and running gear which was structurally very weak and prone to failures. As a result, most of the T-32 vehicles spent months in the Army’s repair workshops. 3: In rearguard operations, they were to attack enemy flanks position and slow down their movement. 5: Used as a vanguard on enemy flanks, two T-32s, would advance ahead, while the remainder would wait as a reserve and act as a fire support. Through the use of these tactics, we can see that T-32 was not intended as an assault vehicle (like some German vehicles). Its purpose was not to directly attack enemy units and positions but instead act as a support element on the flanks with a surprise factor, in order to maximize on its low silhouette, good speed and gun and at the same time minimize issues with the lack of more crew members. Frontal attacks was only permitted when enemy’s forces were surprised, and large amounts of supporting forces (infantry and artillery support) were available. An interesting fact is that the T-32 were involved in military exercises at Ada Ciganlija (Ада Циганлија) near Belgrade (Београд) in 1940. These exercises were recorded in the first color documentary film (the first ever recorded in Yugoslavia/Serbia). On this film, we can clearly see camouflage colors of these vehicles – chocolate brown, dark green and ocher. During the military coup conducted by a group of pro-Western Yugoslav Air Force officers on the 27th of March 1941 in order to prevent the government of Yugoslavia from joining the Axis power, some armored units were used in supporting this coup (included with the T-32s). Issues with these vehicles already arose during the first year of service. As previously noted, the running gear broke down often and some vehicles were out of service for several months due to a constant need for repairs. To solve these problems, the Škoda factory sent its teams of mechanics, who after extended work removed most of the deficiencies. After initial experiences, the Yugoslav military leadership demanded the development of better armored and armed vehicles with much better running gear. Based on these new requirements, Škoda developed a completely new tankette Š-I-J (‘J’ for Jugoslavsky/Yugoslavia). The prototype (named T-I-D, the ‘D’ is for diesel) which was completed in May 1938, was armed with a stronger 47 mm A-19 gun plus one machine gun, the frontal armor protection was 30mm, and the sides were 15mm thick, a more powerful engine and most importantly improved suspension. In March 1939, this new prototype was presented to the Yugoslav military delegation. The Yugoslav Army was pleased with this new model and was interested in purchasing 108 tankettes, however, Hitler’s occupation of Czechoslovakia put an end to any further deliveries. Before the outbreak of the April war, the layout of the Yugoslav Army armored units was as follows: First battalion with command HQ was in Belgrade. The companies with FT and M-28 tanks were assigned to Second Army in Sarajevo (Сарајево), Third Army in Skopje (Скопље) and Fourth Army in Zagreb (Загреб). The second battalion with R35 tanks was in Belgrade, but parts of this unit were sent to the Third Army in the autumn of 1940. A squadron of fighting vehicles was based in Zemun (with all eight T-32). In total, Yugoslavia had about 118 tanks and tankettes available prior the Axis invasion. Aside from the eight T-32s, the Zemun squadron of fighting vehicles had in its inventory an armored car platoon of two Berliet and one SPA (an old First World War-era armored car) and two indigenously armored trucks. It was originally planned to reinforce these units with new Italian AB-40s, but the outbreak of war prevented this from coming to fruition. The Zemun squadron was tasked with protecting the airfield against possible enemy airborne assault between April 6 to 10, 1941. Following the German advance on Zemun and Belgrade, the squadron was ordered to move towards the City of Niš (Ниш), without any specific task. It appears that (according to some old photos) at least one T-32 was abandoned in Belgrade. It probably did not participate in any fighting and was possibly abandoned due to mechanical breakdown. In the vicinity of the Avala (Авала) Mountains near Belgrade, the squadron received orders to move as fast as possible towards Mladenovac-Topola (Младеновац-Топола). When the unit arrived in Mladenovac, to their amazement there was no supply of AP ammunition, but it was instead supplied with fuel. During the night, the squadron was based in direction of Mladenovac-Aranđelovac (Арнђеловац)-Topola. By order of the Sixth Army Command, the squadron moved towards Topola with the primary objective of closing and defending the road leading from Mladenovac to Belgrade. One patrol of two vehicles was sent to Kragujevac (Крагујевац) that morning. One T-32 had a breakdown and was abandoned along the way, while the other one continued alone and after some time met a German armored column who attacked it immediately. By pure luck, this tankette did not suffer any damage in the skirmish, but on the road back to base it also had a breakdown and was abandoned. Due to these losses, the squadron had only 4 or 5 operational vehicles left. There was no time for a rest because shortly after the skirmish, German forces attacked the positions of the Yugoslav Army near Topola and Mladenovac. According to various sources, the Germans had several (possibly three) damaged tanks and one command vehicle (type unknown). Yugoslav accurate losses are not known, the commander of the squadron Captain Dušan Radović was killed in action. Some sources claimed that the last vehicles were destroyed at Mladenovac, which would mean that at least some managed to leave Topola. By the end of the April War (6th to the 18th of April 1941), all tankettes were lost. The Germans managed to capture at least two vehicles or possibly more (there is no accurate data) in various conditions. Use of these vehicles by the Germans are unknown. There is no confirmed information that they were ever used in occupied Yugoslavia against Partisans or Chetniks units. According to some sources, they were sent back to (now in German hands) Škoda factory for refit and repair and afterward they were given to the Waffen SS units who used them for training, however, this is not confirmed. The German designation for Š-I-D was Pz. Kpfw. 732 (j). It’s very likely that all the captured tankettes were eventually sent for scrap metal at some point during WWII. None of the tankettes survived the war and their fate remains unknown to this day. Only a few vehicles were ever built (eight) due to many factors, foremost being the German occupation of Czechoslovakia which resulted in the immediate stop of production and thereby the ability to purchase more of these vehicles. Armament Skoda A3J 37.2 mm, ZB vz.30 J machine gun. (Ammunition for main gun: 42 rounds, and machine gun 1000 rounds). Dušan Babac, Elitni vidovi jugoslovenske vojske u Aprilskom ratu. Branko Nadoveza, Nebojša Đokić, Odbrambena privreda Kraljevine Jugoslavije, Beograd 2014.